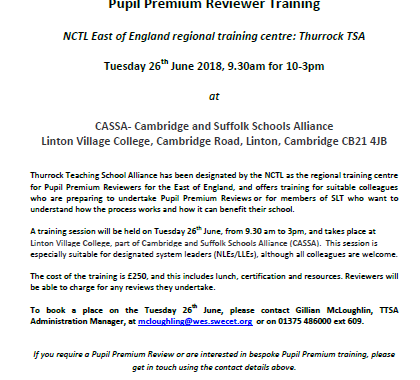 A training session will be held on Tuesday 26th June, from 9.30 am to 3pm, and takes place at Linton Village College, part of Cambridge and Suffolk Schools Alliance (CASSA). This session is especially suitable for designated system leaders (NLEs/LLEs), although all colleagues are welcome. To book a place on the Tuesday 26th June, please contact Gillian McLoughlin, TTSA Administration Manager, at mcloughling@wes.swecet.org or on 01375 486000 ext 609. Tagged cassa, east of england, eastern region, PP, pupil premium, regional training, reviewer.